Today’s Art Walk is a walk through one of our favorite places, the Etsy market. And how about this great print, feature here called Siamese Cat Print Oriental Beauty. 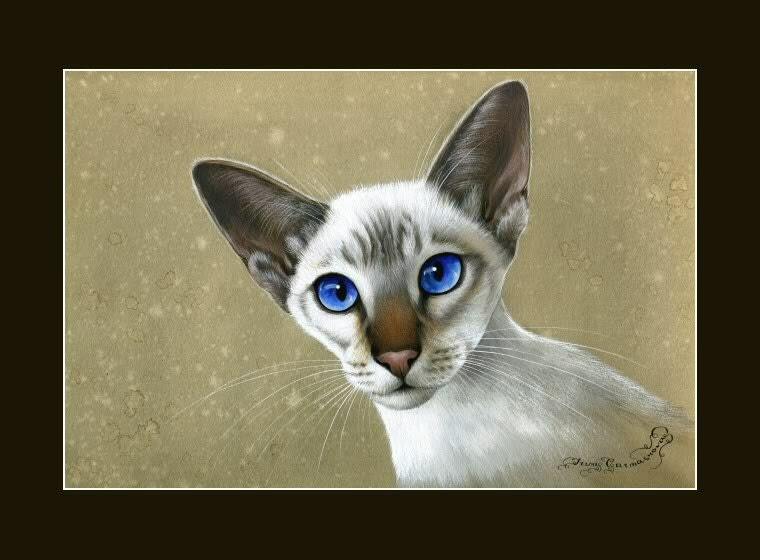 Irina, the artist has a number of wonderful prints featuring cats, several of which feature Siamese. She’s not a cat blogger, but I can’t help but be stunned by her artwork. I’m also enjoying a print called Fire Cats with all the lovely reds and yellows featuring our favorite breed, the Siamese. No one would mistake these cats for me, but they are fun. There’s a digital Siamese cat art print that’s quite striking as well. This I could image being of me! There’s also an amazing water color of a very blue eyed cat that you might enjoy. Now here’s a question for all those fine etsy artists. Why did you all call your prints Siamese Cat Prints (except for the Fire Cats). Because I was getting tired of printing that title and they were all lovely. These are only a few of the wonderful prints you can find when you search Siamese Cat Art on this site. And yes, we have some wonderful cat blogosphere artists selling their wares over there so I need to get the Woman to solicit them for interviews! That’s some fine art, Chey! I think the water color Siamese looks a lot like you. How is Miss Gemini’s tummy? What did the vet say? This is awesome art – I thought they were all gorgeous! In agreement here. Excellent paintings, some talent, for sure. Loved the Fire cats too! Hey what’s a vet update? Ahhh, Siamese are the most artistic of cats! Teri says she always remembers the book she had with Roberta Flack and her lovely Siamese…both very exotic looking! Teri loves wandering around Etsy! That is a super painting. Love the gorgeous eyes. She really does do a great job. Etsy is a great place. We love homemade stuff. Miss Gemini I will gladly come over and snuggle up with you and hold your paw to make you feel better. The paintings are all beautiful. Mum likes the vivid colours of the Fire Cats. All Siamese are works of art. I’m just catching up. Hoping that Gemini is feeling better. Good to remind us to check out Etsy more often too !! Irina’s cat prints are lovely! Ooooh, such indeed a beauty—! I can also see such a print of YOU too. Tommy has soft spot for blue eyed kitties–she melts when she looks at YOU! Me loves the pictures you showcased! And me gives yous an answer to your question because Mommy used to sells her work on Etsy (and another great art site – ArtFire). Me thinks you asked, why did they all call their pieces Siamese Cat Print? That is because that is what peoples uses when they search! So, if yous puts those in your title, then your paintings come up on the search!